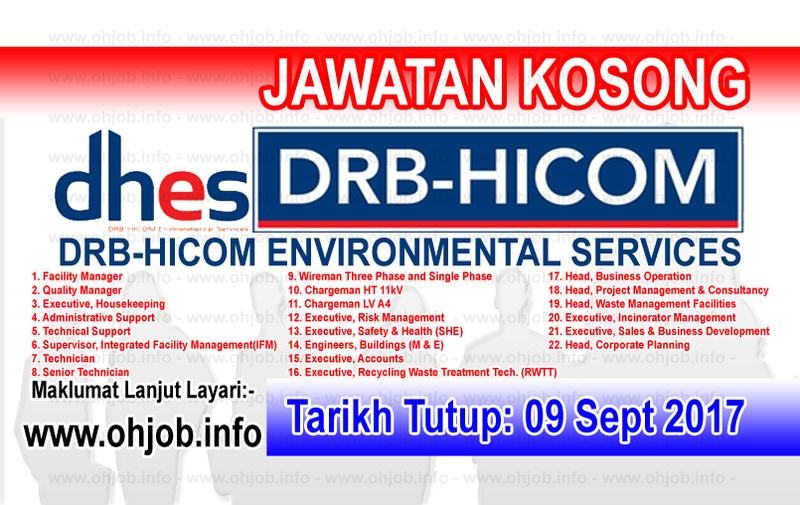 Established in 2013, DRB-HICOM Environmental Services Sdn Bhd (DHES) is a fully-owned subsidiary company of Alam Flora Sdn Bhd (AFSB) under DRB-HICOM Berhad Group (one of Malaysia’s leading conglomerate listed on the main market of Bursa Malaysia Securities Berhad). Certified with ISO 9001:2008 in 2015, DHES has been delivering quality services to various corporations, government agencies and institutions throughout the years. DHES specializes in providing comprehensive environmental services to enrich the quality of life. We always strived to provide the highest quality of environmental services where our customers’ satisfaction is our utmost priority. We offer various competitive and premium environmental services including management consultancy, system analyses and technical inspection. Beyond solid waste management, DHES has diversified the businesses and services through innovation into several distinct core businesses. Terima Kasih Kerana Membaca Dan Menyemak Jawatan Kosong DRB-HICOM Environmental Services (09 September 2017) Selamat Memohon Dan Semoga Berjaya Kami Ucapkan, Sila LIKE Facebook Page Kami Dan Kongsikan Kepada Semua.